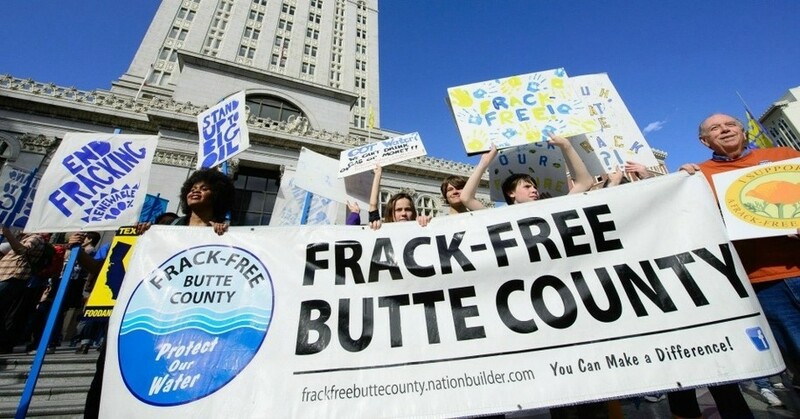 The voters in Butte County, California approved Measure E, a ban on fracking, by an overwhelming 71 percent on June 7. Butte is the fourth California county to ban the environmentally destructive and dangerous method of oil extraction, according to a statement from Frack-Free Butte County, the campaign organized by the Citizens Action Network (CAN), in coordination with the Butte Environmental Council, in the largely rural and agricultural county. San Benito, Santa Cruz and Mendocino counties have also passed fracking bans, as have the cities of Beverly Hills and Carson. Measure E proponents were able to convince the voters that toxic fracking chemicals would destroy the county’s water supply and farmlands, as well as endanger the health of their citizens. The toxic chemicals used in fracking, including benzene, toluene and other carcinogens, could make groundwater unsafe for drinking and irrigation. "We congratulate Butte County for banning fracking and protecting California’s precious water resources," said Ella Teevan, Northern California organizer with Food & Water Watch. "When our Governor and local elected officials fail to act, voters are taking the initiative at the ballot box to protect their health and their water from fracking. The victory in Butte County will inspire other counties and cities to follow suit." The latest victory against fracking in a California county shows that grassroots activists can indeed win, in spite of the oil industry’s power and influence, when they are organized. Big Oil is the biggest and most powerful corporate lobby in Sacramento — and the Western States Petroleum Association (WSPA) is the biggest and most powerful lobbying organization. The oil industry, including WSPA, Chevron, Phillips 66, AERA Energy, Exxon and Shell, have spent more than $25 million so far in the 2015-16 legislative session. Big Oil also has millions and millions of dollars to spend on election campaigns. There was no official opposition to Measure E during the campaign, but activists believe that it is likely that the oil industry will file a lawsuit like Marathon Oil did when San Benito passed its measure ban against fracking in 2014. On June 6, 2014, attorney Sean P. Welch of the San Rafael-based firm Nielsen, Merksamer, Parrinello, Gross and Leoni filed a lawsuit against the initiative proponents on behalf of an oil industry group called “Californians for a Safe Secure Energy Future.” The lawsuit claimed that the initiative petition sheets that were submitted had several fatal legal flaws that made it invalid. This measure is one of four similar initiatives passed in the state that has been contributing to the growing anti-fracking momentum currently at the forefront of the political discussion, Measure E advocates noted. The passage of the Measure E ban on fracking comes after a similar ordinance failed to pass the Butte County Board of Supervisors in February of 2015, due to oil industry opposition. Residents were concerned that the county’s 200 abandoned gas wells were ripe for fracking since the practice is occurring in neighboring Glenn, Colusa and Sutter Counties, according to Measure E proponents. As of February 2015, there were 10 active gas wells in Butte County, with many more wells in nearby Glenn County and Tehama County. In early 2015, none of the wells had been reported as hydraulically fractured, according to Frac Focus. There are also 17 natural gas storage wells, depleted wells that are currently used for storage, operated by Wild Goose Storage, according to Garcia. That operation is similar to the Aliso Canyon Gas Storage facility, the infamous operation responsible for the massive gas leak that forced thousands of residents of the Los Angeles County community of Porter Ranch to move out of their homes last year. Residents of Monterey and Alameda Counties watched the Butte County measure closely with an eye to their own local campaigns, Teevan noted. Alameda County’s Board of Supervisors is expected to vote on a fracking ban sometime this summer, while Monterey County voters will tackle the issue on the ballot November 7.